On your next cross-country excursion, the Hyundai Santa Fe will make a wonderful travel companion, offering a home away from home for you and your guests. Both the Santa Fe and Santa Fe Sport are prime choices among crossover SUVs thanks to their competitive pricing, great standard tech features and in-demand safety options. 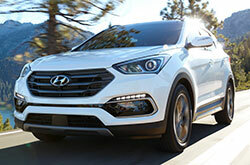 So, what's the difference between the Santa Fe and Santa Fe Sport? 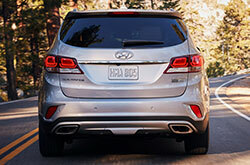 The Sport model is a compact two-row crossover SUV, while the Santa Fe is a midsize SUV with three-row seating. With two sizes to choose from, you can find your right fit. Continue our 2018 Hyundai Santa Fe review to learn more. If you purchase or lease a 2018 Hyundai Santa Fe or Santa Fe Sport in Phoenix, you'll benefit from added BlueLink services, which are now included for free for three years! In addition, both models now include standard wood-finish trim on models outfitted with leather. The Santa Fe Sport also offers an all-new Value Package with heated dual-power side mirrors with turn signal indicators, a proximity key with push-button start (Remote Start included with BlueLink app), and power windows with front auto up/down. Other notable features offered in the lineup are Apple CarPlay and Android Auto, heated front seats, roof rails, fog lights and LED daytime running lights. Test drive a 2018 Hyundai Santa Fe in Phoenix and try out its plethora of engines. 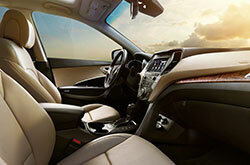 The standard three-row Santa Fe can be equipped with a 3.3-liter Lambda II V6 engine that produces 290 horsepower. If you choose the Santa Fe Sport, it can be had with either a 185-horsepower 2.4-liter direct-injected four-cylinder or a 240-horsepower turbocharged four-cylinder. Every engine is attached to a six-speed automatic transmission. 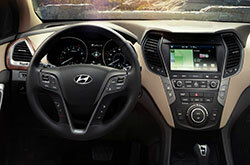 The Hyundai Santa Fe includes several safety features that provide comprehensive security. Just a few features include Vehicle Stability Management with Electronic Stability Control and Traction System, Hill Start Assist Control with Downhill Brake Control, four-wheel disc brakes and ABS with Electronic Brake-Force Distribution, and Tire Pressure Monitoring. 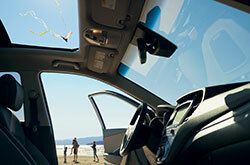 In addition, a backup camera comes standard along with Hyundai's emergency system - BlueLink. On select models, lane departure warning, front collision mitigation, blind spot monitoring and rear cross-traffic alert are available. After finishing our 2018 Hyundai Santa Fe review, schedule an appointment at our car dealership on Camelback Road for a test drive! 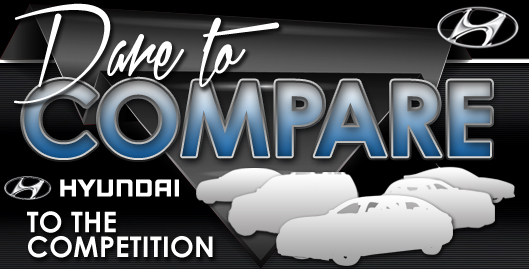 In the market for the 2018 Chevrolet Equinox, Ford Explorer, Toyota RAV4 or the Mazda CX-9? You should also visit Camelback Hyundai to take a look at the radiant 2018 Hyundai Santa Fe and find out why it's a commendable option. You could end up loving its user-friendly on-board technologies and eye-catching looks! Utilize our review and try out the comparison tool to see if the 2018 Hyundai Santa Fe is well-suited for you. Also, view finance and lease offers while you're here! 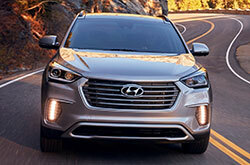 We're a local Hyundai Santa Fe dealer with money-saving offers on new and used vehicles. Note the info that you found pertinent after reading over our 2018 Hyundai Santa Fe review; those are the points that will keep you from making a purchase you later regret. We have numerous Hyundai Santa Fe models for sale at Camelback Hyundai in Phoenix, AZ; stop by to take a test drive - scheduling an appointment on our website is easy. Want to see it before your visit? That's no problem - viewing the enclosed video recording will give you a peek at its exterior from all sides.